Update October 2016: Please note that Black Pearl Epicure Retail Shop has closed but the warehouse is still open. 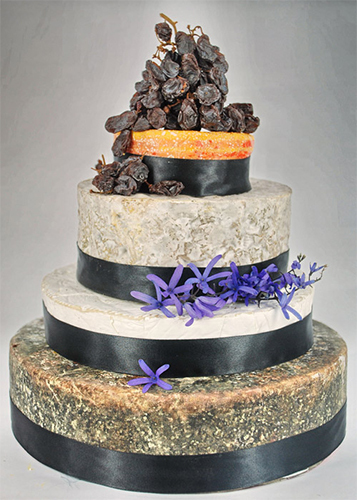 Cheese cakes are starting to become a popular way to celebrate a special occasion. They are ideal for people who like savoury food and are perfect for birthdays, weddings or engagements. A cheese cake is simply a pile of cheese rounds decorated with ribbon or left naked. They can be made unique by incorporating colours from your wedding or party décor. Some people like to place a corsage of fresh flowers on top, or you could decorate with muscatel grapes or grape leaves. There are many other ways to decorate your cheese cake and you can find inspiration online. Jan Cranitch from Black Pearl Epicure advises customers to first work out their budget and how many guests you are inviting. It is best to use a cheddar, blue and brie as your base cheeses. You want to select cheeses which are mild to medium tasting as these will be the most popular with your guests. Some cheeses which are good for the base are Maffra Mature cheddar, Le Dauphin soft ripened cheese and Cashel Irish Blue. 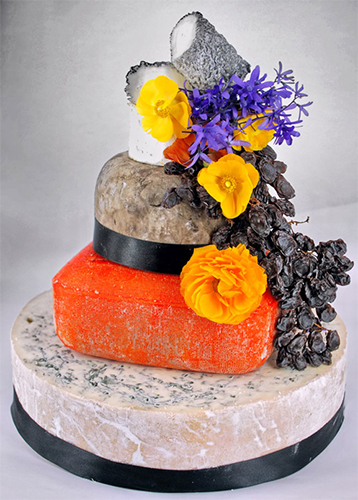 You can top the cake with extra special cheeses such as Woombye triple cream brie, Yarra Valley Dairy black savourine (goats) and Will Studd Brillat Savarin. Jan Cranitch recommends placing the cheese on a rustic cutting board, with a knife for each different cheese. Serve with freshly baked bread, grissini, Karrajong Kitchen Lavosh, Peter's Yard Sourdough or artisan crispbread, or Misura crackers. Black Pearl Epicure specialises in cheese cakes and Jan Cranitch can step you through the process of selecting the best cheeses.